Since the death of the baby birds I have kept an eye out for the mother and father birds to no avail. They seemed to have disappeared. However, literally moments after I sat down to paint and draw this mixed-media picture of their abandoned nest, now blooming with marigolds, the mother came and perched on the top of basket. She leaned down almost as if admiring the flowers, then hopped down to the side of the basket. Looking through the glass storm door at me, she cocked her head. I barely breathed, not wanted to scare her. We stayed like this a few moment then she flew away. I haven’t seen her again since. I know it’s far-fetched, but I like to believe she approved of me honoring her loss and came to let me know. Here are some warm weather inspired paintings I currently have available. Send me a comment to purchase. Happy viewing! 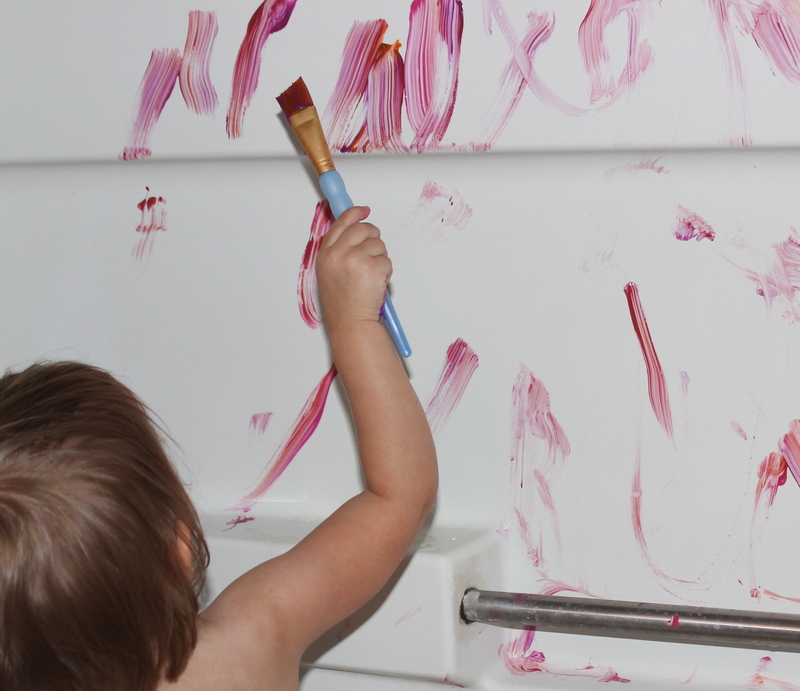 Or “Paintin’ in the Bathtub” (that should be sung to the tune of “Smokin’ in the Boys’ Room”). In the end the shower looked a little like a screen shot from Psycho, but with a much higher adorability factor and a negative scary factor. of chirping accompanied our comings and goings through the door. One day last week my little girl and I came home from running errands and she excitedly ran around our driveway picking up rocks (she’s obsessed). I heard her say, “Oh!” I looked over to see an oddly shaped pinkish thing on the concrete in front of her. As she reached toward it I realized it was a tiny, featherless, motionless baby bird. “Don’t touch it!” I barked, then putting on false calm and cheer I said, “It’s a baby bird. He’s taking a nap in the sun. Let’s leave him alone.” I scanned the area and realized the nest had been destroyed. Turning to go inside I almost stepped on a second chick. This one clearly still alive. Heart pounding I took my toddler inside, convinced her that we did not need to take the baby birds a blanket for their nap, and distracted her with Cinderella while I tried to figure out what to do. After consulting with my husband and leaving a message with the bird rescue at Oak Mt. State Park, I put plastic bags on my hands (we didn’t have any gloves) and stepped outside. Approaching the first baby bird, I knelt down. He was so tiny. I expected to have trouble picking him up. However he craned his head on his too thin little neck toward my hand and actually seemed to do his best to work his way into my palm. I can’t in good conscious say he was cute… He was bald with huge closed eyes, however it was odd to me the similarities he seemed to share with fetal humans. We all start out pretty scrawny and ugly and I felt a maternal sort of protectiveness for him. I put him back in the nest, then went to help his sibling who I thought was already dead. I was wrong, though! He, too, craned toward my hand. The rest of the afternoon I worried over them. Their mother flew back and forth to the nest and I thought maybe they’d be ok. A lady from Oak Mt. called me back and told me I’d done the right thing (and, for future reference, the gloves were unnecessary. The whole thing about your scent making the mother abandon them is a myth) and that the mother could tell whether or not they would make it. They didn’t make it. I confess I cried. So yesterday, despite other things I needed to do during my little girl’s nap, I had a bird funeral. I put them under the tree where I normally saw their mother. Walking into the garage to put away my spade and gloves, I heard a familiar chirping. I looked up to see the edges of a nest high in the rafters near a space where the roof and wall don’t quite connect, leaving an opening to the outside. New babies! In my garage! I smiled. This weekend I think I’ll buy some flowers to plant in the basket. “I hate technology,” I say as I type on my iPad, posting to a blog that people all over the world can read. The truth is that I don’t hate it, I hate relying on it and I hate when it doesn’t work right. Ironically (or is it coincidentally?) between the first sentence and now I actually switched from typing on my iPad to using my “real” computer because my iPad wasn’t cooperating. I’m pretty certain it’s smirking at me right now. I haven’t posted in ages because my *ahem* blessed computer wouldn’t detect my camera when I attempted to load photos from my camera to the computer. No pictures on computer = no pictures on blog = why would you bother unless you’re just reading this for my charming wit? Maybe I just need to embrace technology MORE fully and have a fancy phone that takes good enough pictures that I can skip the camera all together, but I’m just not ready for that commitment to technology. I mean, who knows when all this computer stuff will just all blow over and we’ll be back to yelling at each other through tin cans and a string? Seriously!? While waiting for my phtos to upload to my blog I went outside to bury some baby birds (one of the many stories I have for you) and came back in to find that my computer was just blank… black screen, no response, will not turn back on. So, now I’m back on my iPad… which again wasn’t cooperating and I finally managed to get my computer back on. So, now I’m on my computer AGAIN. This is ridiculous. 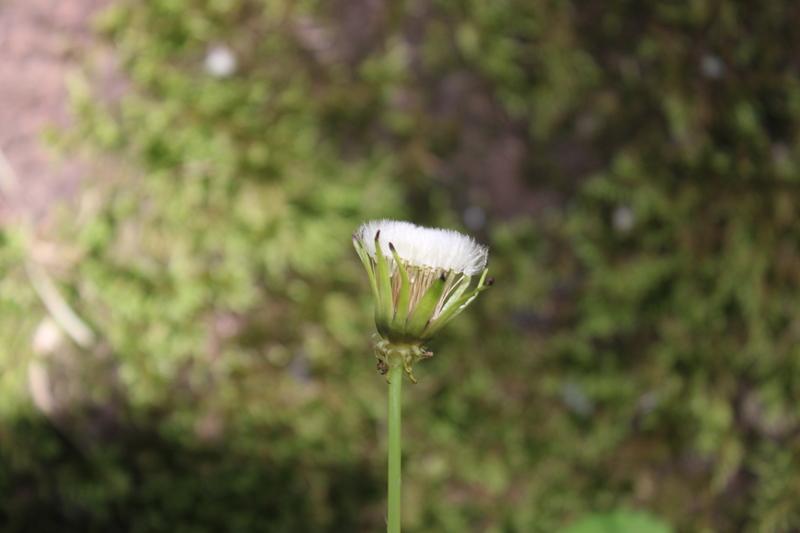 Dandelion in the process of “puffing.” Literally an hour later it was a dandelion puff. Pretty cool, huh? What a long strange trip it’s been from the beginning of this post to now, so I will leave you with this peaceful picture and the promise that if you do not hear from me soon it’s nothing personal, it’s just that my computer has destroyed me.